Four bugs sit 10 inches apart in a square. They move toward each other, forming a logarithmic spiral. How far do they move until they hit the center? Does this address any confusion? Guha and Mikey, if nothing else, demonstrate that upside-down sunglasses really do look like bug-eyes. A relativity game indeed. They answer correctly, and are this week’s winners! ‘Suppose the beetles always move with velocity v towards the next beetle. The radial component of v will be v*cos(pi/4)=v/sqrt(2) for the entire path. 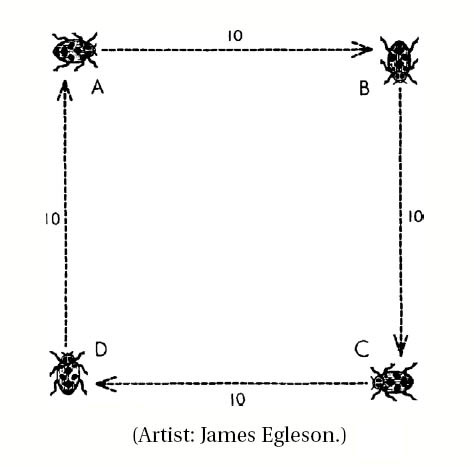 ‘The radial distance from each beetle’s starting point to the centre of the square is 10/sqrt(2). Distance travelled radially = (time taken along entire path)* (radial speed). So each beetle will take a time of (10/sqrt(2))/(v/sqrt(2)) = 10/v to reach the centre of the square. I got two good poems this week, and they deserve special mention. They’ll go in the Hall of Fame page later today. THE FINAL PUZZLE, after the jump. A cylindrical hole 6-inches long has been drilled straight through the center of a solid sphere. What is the volume remaining in the sphere? Some of you have noted that this form has cut off after a line. I’m sorry if it gives any more trouble. If I get any answers that seem to do so, I’ll shoot you an email.